Hey y’all! I wanted to pop in with a quick update on one of Instagram’s latest features: Stories Highlights! It sounds like a bit of a mouthful, but Instagram is officially calling them Instagram Stories Highlights. So that's what we're going with folks! Instagram’s Stories Highlights feature allows you to group together your past Instagram Stories and permanently place them underneath your bio. Some businesses and influencers are using Highlights in full force, but there are still plenty that haven’t quite gotten the hang of it. If that sounds like you, read below for our how-to on understanding and creating Story Highlights. So Why Should You Even Use Highlights? How about a little stat for ya from James Nord at Fohr Card to kick off why you should do Stories... You'll gain at least 50% more Story views once you’ve made it a Highlight (overtime of course). Stories Highlights are a great way to organize your material in a way that allows your follower base to get to know you better (and quicker, too). When choosing what to include in your Highlights, think about what sort of content you want your followers to pay the most attention to. For example, if you have a list of Frequently Asked Questions, you may want to create a Stories Highlight containing videos of you answering those questions individually. That way, every time you get asked another one of your FAQ’s, you can redirect your followers straight to your new FAQ Stories Highlight! My favorite use right now as I'm gearing up to travel abroad is when people go places and group all their Stories from that place into one Highlight. Then I can go and see all the beautiful places they went to in Croatia for example when I'm planning my trip. Another way of organizing is to do a Highlight for each of your brand pillars (if you don't have brand pillars, we can help!). On our profile for example, we’ve chosen categories we feel reflect the heart of our brand: Social Updates, Charleston and so on. Want one rule of thumb - just think about big picture moments that will “live beyond” just a snippet of your day. These are great for live Stories, but won’t typically contribute much to your Stories Highlights. And, as a bonus, we’ve added the link to free, colorful templates of our Stories Highlights covers! 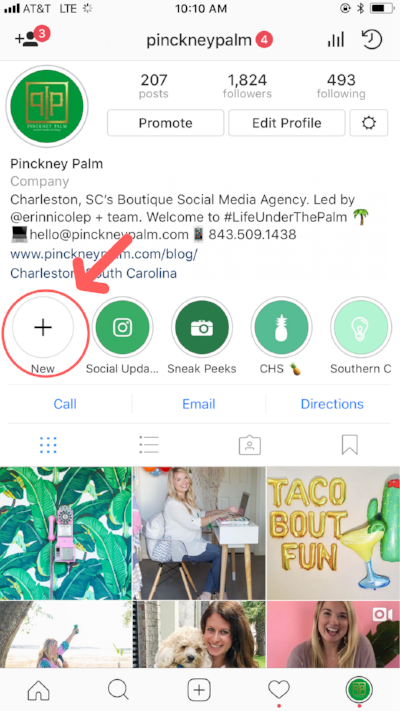 Make sure you follow us on Instagram to continue seeing how we use them: @pinckneypalm. STEPS to creating your first Stories Highlight are as easy as 1, 2, 3! 1. Once you open up your Instagram profile, tap the “New” circle below your bio with the plus sign on the far left. 2. From there, you will be able to choose which photo or video you’d like to highlight from your archived Stories. 3. Once you’ve selected a photo/s or video/s, choose a title and cover photo for your Stories Highlight. (Click here to download the cover images we use for our Stories Highlights on @pinckneypalm!). Note: If you're retroactively adding a cover to an existing Highlight, see below on how to add a new Story to an existing Highlight. Just click "Change Cover" when you edit your Highlight and select the new Story you want as your cover. 1. Click on the Highlight you want to add a Story to. 2. Click the "More" button under the 3 dots in the bottom right of your screen. 4. Click "Archive" in the top right corner under "Edit Highlight" and "Done". 5. Choose the Story you want to add by clicking on the photo/s. 6. Click "Done" and they'll now be added to your Stories Highlight. Note: As mentioned above, if you want to go in and add a cover to an existing Highlight, follow the directions above and then go to "Edit Cover" while you're editing the Highlight then select the new cover. YOUR STORIES HIGHLIGHT COVER HAS TO LIVE FOR 24 HOURS IN YOUR STORIES to be able to use it as a cover. You can't just upload the pretty cover and then delete it and be able to use it as a cover. While you can have as many Stories Highlight categories as you’d like, only your first FIVE will be visible on your profile before your followers have to swipe for more. Just like regular Stories, Highlights are not searchable. Unless you have a strong enough follower base where you could potentially end up on the Instagram “Explore” page, the only place your Stories Highlights can be viewed from is your profile. OR if you use a hashtag in your Story and are linked to that hashtag's Story. Once you’ve created your Stories Highlight, you’ll be able to add up to 100 photos and videos to that specific category in the future. Once you hit the 100 limit, new Highlights will push out the old. We’ve had so much fun playing around with Instagram’s new Stories Highlight feature and can’t wait to see what y’all come up with!